Siblings all grown up…. – Journey to my heart…. I love this picture. I love thinking about four of us playing together and bringing goofy and craziness into our home. I remember when Arlene and I would put a big brown blanket over Len and Nick and make them our horse and they would take us all through the house. I remember watching Emergency and playing baseball in the yard. I have good memories of growing up with my siblings. 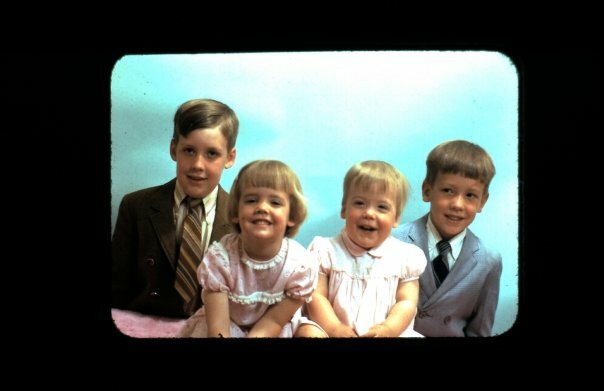 Of course when Suzi was born and four became five, there was just more fun in our home. Fast forward to today and it is hard to imagine that Arlene now has a daughter old enough to graduate from High School. What happened to the years? That seems to be a theme in my thoughts lately. Could it be cause I am now 41 and realize that life has been full and full of memorable moments…. Arlene and I are 16 months apart. We grew up sharing a room, playing together on the playground, singing in bed at night and baking cookies on Saturday. We have shared clothes and friends, fights and unforgettable moments. When we were younger, I know I was not always as kind or generous as I would have liked to have been with Arlene, but today, we share a very dear friendship. Today I can say that her first love is her family. Although Arlene has pursued her dreams and graduated two years ago with her nursing degree, she remains in love with her husband and children. Arlene is always full of life and passion, she is upbeat, encouraging and hopeful. I love to laugh with Arlene and we often will both end up in a silent hilarious spell of laughter. I admire Arlene for being the first sibling who became a mom. She has blazed the trail and has done it well. Her kids on most days, almost every day, would say she is a great Mom. They know of her commitment to them and that she would do most anything to help them succeed. And so, as we prepare to celebrate Mother’s Day in our family this weekend (one week late), I am thankful for my older sister Arlene and her commitment to raise up her kids in the way of the Lord….she has demonstrated what it means to be in love with her children and in that, to love them well! Happy Mother’s Day Arlene. Know that I celebrate your role as Mom to my five amazing nieces and nephew, way more than one day a year! Thank you, Trish! What a nice start to a Saturday morning :). You are so dear. Love you! Previous Previous post: Struggle well….